The Buds and Lattice lace is a beautiful lace stitch that looks very intricate and elaborate. 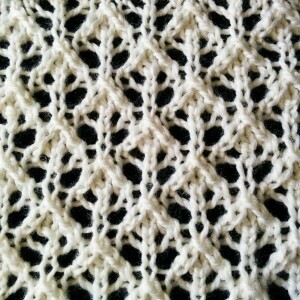 Even though it looks complicated, this lace stitch is not difficult to knit. Just like the name, the construction of the Buds and Lattice lace stitch involves tiny flower buds running throughout the work while being overlapped with a lattice design. Knitted in a multiple of 6 sts + 1 and with an 8-row repeat, this pretty lace stitch is great for those who are looking to start a lace project that is not long and arduous. The Buds and Lattice lace stitch is perfect for all types of projects and its excellent drape makes it wonderful for scarves and cowls. Row 1 (RS): k1, *yo, k2tog tbl, k1, k2tog, yo, k1; rep from * to end of row. Row 3: k1, *yo, k1, sl 1, k2tog, psso, k1, yo, k1; rep from * to end of row. Row 5: k1, *k2tog, yo, k1, yo, k2tog tbl, k1; rep from * to end of row. Row 7: k2tog; *(k1, yo)x2, k1, sl 1, k2tog, psso, rep from * to last 5 sts, (k1, yo)x2, k1, k2tog tbl.